“Invention” is a wonderful word, derived from words meaning “scheme” and “a finding out.” Inventors draw on materials provided by the natural world, refining and combining them in insightful ways, to make something useful. In this experimental module we will invent materials by manipulating biological systems, namely the bacteriophage M13. 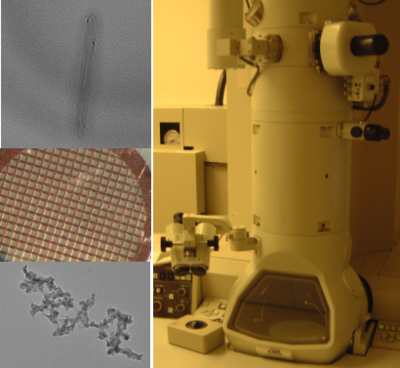 We will use a very slightly modified phage to build Iridium nanowires that we’ll visualize on the transmission electron microscope. Then we'll let the phage themselves do the building, making an electrochromic device that's both fun and potentially useful. Drawing on the rich stockroom of biological elements and a good but incomplete understanding of their behavior, we’ll hope to invent some novel materials with real-world applications. This page was last edited on 12 October 2007, at 14:16.